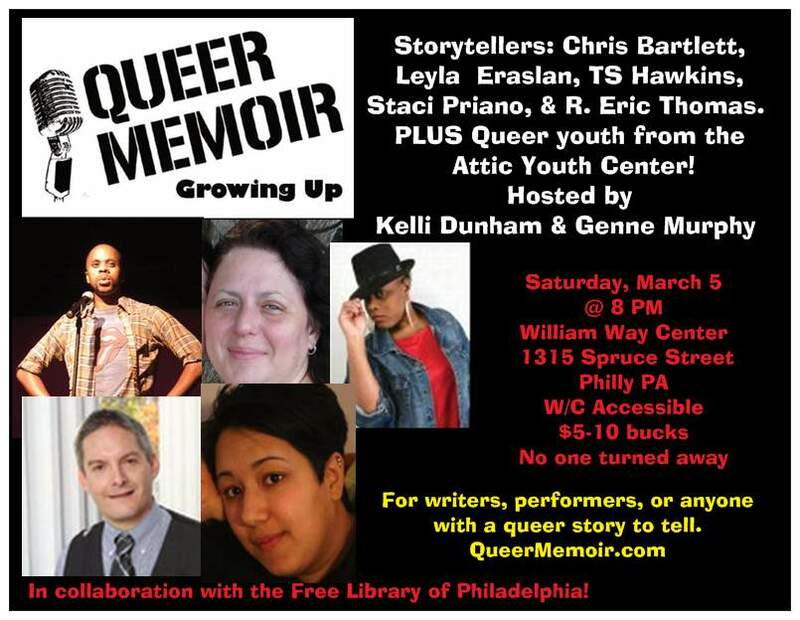 Join us for this special salon in Philadelphia on Saturday, March 5 @ 8pm! The Free Library of Philadelphia invited Queer Memoir to create a special salon as part of One Book, One Philadelphia, and inspired by themes in the writings of author Sherman Alexie. Queer and LGBT storytellers of all ages will be sharing that night on the theme of “Growing Up.” The salon will be hosted at the local William Way LGBT Center. Queer youth from the Attic Youth Center! LEYLA ERASLAN owes her unrepentant weirdness to a South Jersey upbringing and reading too many books. Currently an employee of a Philadelphia arts education nonprofit, Leyla lives in South Philly, or so it is rumored. 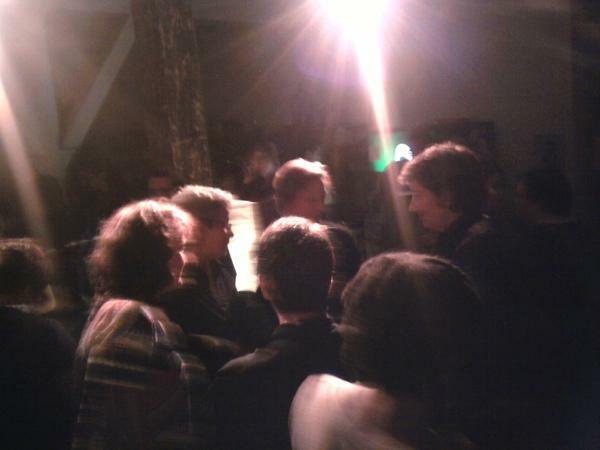 In 2008, she wrote, directed and co-produced “Love After Death” for the Philadelphia Fringe Festival. She frequents the Walking Fish Theatre Open Mic and has participated in The Five Minute Follies. She has been involved in a smattering of artistic endeavors, and likes the word ’smattering’. Leyla’s passions include art, helping people, and drawing lips in the corners of her notebook. STACI PRIANO is a 45 year old Lesbian, Nurse, Mom, perpetual student, slightly twisted looker at life, and a Grandmom to boot. She’s been around the block a time or two and has gathered very little moss but has retained a tale or two about the journey; cautionary, maybe, interesting, hopefully. Poignant, funny, gripping? Well, you’ll be the judge. R. ERIC THOMAS is a playwright, storyteller and essayist. He is the author of the plays “Lost Boy”, “The Spectator” (Run of the Mill Theater Company, 2005), and “The Affair” (LateNite Theater, 2001). He recently won Best Presentation at the First Person Arts Summer Grand Story Slam for his story “My Mother Hates The Facebook”. 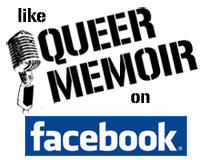 He is delighted to be reading at his third Queer Memoir and is starting Philly’s own LGBT literary salon this summer. Presently, Eric is working on plays about time travel, Santa Claus, bureaucracy and swimsuit models; cyber-stalk him here: enormouslyawkward.blogspot.com. 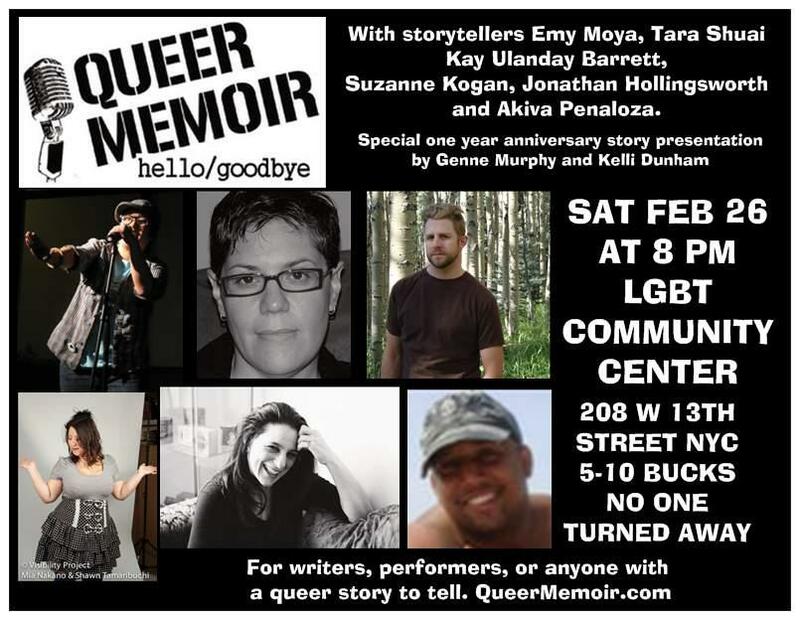 We’re really excited about our upcoming One Year Anniversary Show, with the theme Hello/Goodbye. We have some amazing storytellers, including Suzanne Kogan, Kay Ulanday Barrett, Jonathan Hollingsworth, Emy Moya, Akiva Penaloza and Tara Shuai. There will be some awesome edible treats in celebration of our event birthday as well as many more surprises!